Hundreds of people arrived to the planned protest march in San Francisco on April 5, 1977, weighed down by backpacks bulging with food, medication, and basic supplies. Adults, teenagers, and parents accompanying their children came from around the Bay Area and from varied socioeconomic backgrounds. The crowd was largely comprised of individuals who were deaf, blind, using wheelchairs, living with mental disabilities, and living with paraplegia and quadriplegia. In cities across the United States that morning, similarly diverse groups assembled for the same reason: to picket the regional offices of the federal Department of Health, Education, and Welfare (HEW) in Atlanta, Boston, Chicago, Dallas, Denver, Philadelphia, New York, and Seattle, as well as the HEW headquarters in Washington, D.C. It was up to the head of HEW to sign and implement guidelines specific to Section 504, which would further inform other agencies including the Department of Transportation and the Department of Housing and Urban Development (HUD). By 1977, disability rights activists weary of asking nicely for their civil rights, decided to move—into the HEW offices, that is. “At that time in history, there was simply no access—no right to an education, no public transit. You couldn’t get into a library or city hall, much less a courtroom,” says 504 Sit-In participant, author, and disability rights advocate Corbett Joan O’Toole. She notes that as late as the 1970s, there were no federally mandated social services or agencies for individuals living with disabilities. If an individual wanted to hire an in-home attendant or interpreter, it had to happen through pre-existing social networks. Protesting can be taxing for anyone. An occupation is often equal parts enduring chronic boredom and extreme physical discomfort, even if the occupation takes place indoors, sheltered from the elements. For many protesters in the San Francisco 504 Sit-In, it was the first time they’d spent any time—let alone weeks—living and sleeping away from home. Many had encountered numerous transit-related obstacles simply traveling to the protest that day. Inside the HEW offices, the need for accommodations amplified. Some people required space for walking aids and wheelchairs. Deaf occupiers needed translators. Protesters with paraplegia and quadriplegia needed assistants to lift and turn them when sleeping and sitting. Over the course of so many weeks with rudimentary accommodations inside an office building, protesters compromised their health to achieve their goals, explains Dr. Catherine Kudlick, professor of history and director of the Paul K. Longmore Institute on Disability at San Francisco State University. “Some lived with toll of that for years,” she says. The Bay Area was a natural home for this type of protest, and not just because of its history as a politically progressive region. Before the implementation of urban accommodations we now take for granted—curb cuts that provide a slope from sidewalk to crosswalks, as well as wider doors and lower counters—the Bay Area had an anecdotally positive reputation in the disability community. Far-reaching public transit, good weather, and wide, well-maintained sidewalks were just some of its more appealing attributes. Population data bears out these popularity rumors. 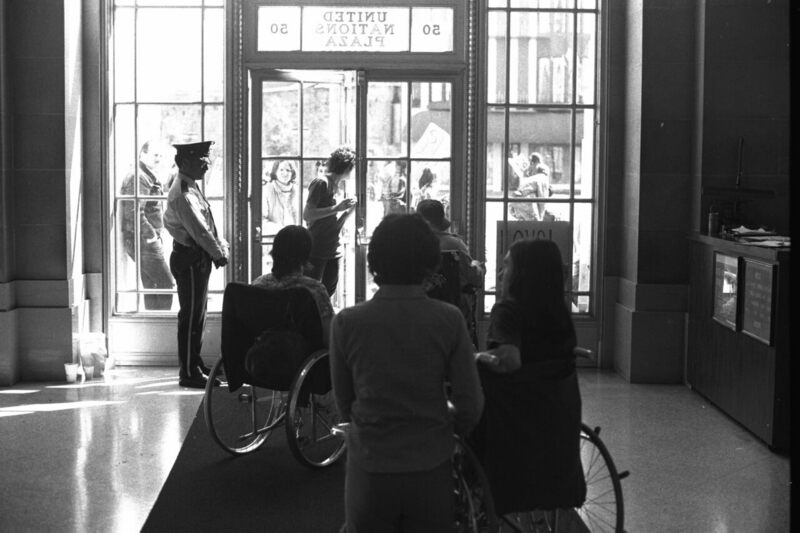 By one estimate, there were 400 people with disabilities living in Berkeley in 1972. By 1976, that number was closer to 5,000. One might accurately call that a critical mass. O’Toole notes that people with disabilities—as well as people who are also part of other marginalized populations such as the LGBT community—are accustomed to the type of cooperative interdependence that was necessary for 504. The 100-plus occupiers and their attendants made the building their own almost immediately, draping a window air conditioning unit with a plastic tarp to create a makeshift refrigerator for medications and using the pay phones to communicate with loved ones and news media on the outside until the FBI cut the lines. There were daily consensus-driven committee meetings about everything from media strategy to how to respond to a bomb scare false alarm, in the event the FBI employed tactics to evacuate the building. Those that couldn’t occupy the HEW offices held daily rallies outside, holding public and media attention for the duration of the protest. The Salvation Army rounded up cots and blankets so protesters wouldn’t have to sleep on the floor. Local progressive social services organizations Glide Memorial Church and Delancey Street delivered food. One often-ignored group integral to the protesters’ success: Oakland’s Black Panther Party. Beginning that first week and continuing until the end of the occupation, local Panthers cooked and carried wholesome, hot meals—meatloaf, fried chicken, rolls, and salad—across the bay to San Francisco every single day. “They [the Black Panther Party] understood what it meant to support a revolutionary movement that wasn’t just on the street with weapons,” O’Toole says, pointing to the Party’s groundbreaking Free Breakfast for Children initiative, which eventually served a reported 20,000 low-income children and influenced federal guidelines for free breakfast and lunch programs still vital in the nation’s public schools. Of the approximately 120 protesters, 14 individuals with disabilities and eight attendants were eventually selected to go to Washington D.C. to attempt to force a meeting with Califano. Even that was a unanimous, consensus-driven decision borne out of many days of discussions. The group’s solidarity wasn’t apparent to the FBI agents guarding the San Francisco building, who mistakenly believed that with 22 gone, they could force the remaining protesters to disperse by generating dissent and instigating false bomb scares. O’Toole says the opposite was true. Once the D.C. contingent had gone, the San Francisco occupiers were wholly focused on one task: holding the building. Without a sustained sit-in drawing daily news reports, they would have little leverage compelling Califano to sign the regulations. In the days that followed, the group forged on, trailing President Carter to his church and following Califano to a press club, before Califano finally relented and signed the regulations on April 28, 1977. Under 504, nondiscrimination became a legal, fundamental right. Within months of the sit-in, noticeable changes began to take place in urban landscapes, in university classrooms, in the workplace, and in public spaces including libraries, courtrooms, and public transit. Cities instituted curb cuts from street to sidewalk. Federal buildings made adjustments to become accessible to all, including installing ramps and wider restroom stalls. Regulations instituted as a result of the success of 504, ushered in a new era of accessibility that led to the passage of Americans With Disabilities Act in 1990. Protests do not always have a concrete aim, and occupations do not always end in victory. Forty years ago, dedicated protesters triumphed after unifying a broad coalition of individuals and community organizations committed to a defined common goal. That every person involved in the 504 occupation felt invested in the outcome helped guarantee their collective success.